Today the burning problem for states in Central Asia is the presence of external interests. Earlier, this influence was considered in the region of China and the European Union. Turkey has been longing to become another, though no less important external regional player for Central Asia. Turkey has always tried to conduct its active pan-Turkish policy on the territory of the former USSR, not only claiming a dominant position in the former Soviet republics with the prevailing Turkic-speaking population, but also patronizing the Turkic autonomies (Tatarstan, Bashkiria, Kabardino-Balkaria and others) as a part of the Russian Federation. One of the main ideas of Turkey’s policy in the region was originally the creation of ‘Great Turan’ under the aegis of Ankara. However, this suggestion did not find approval amongst the leaders of the Central Asian states. Moreover, it caused a sharp reaction on part of all countries of the region. Thus, amid these sentiments, in May 1995, at the suggestion of Islam Karimov, the President of Uzbekistan, an ethno-cultural association was created under the name ‘Turkestan, Our Common Home’, in accordance with which the cultural and economic unity was presented based on the common ethnos and in no way based on the religion. The intricate situation in which Turkey found itself after complications of its relations with the European Union and the USA recently, made Ankara seek more active contacts with the Turkic states of the CIS, thus trying to compensate the economic losses and increase its political influence with the Turkic-speaking republics, using the pro-Turkism ideas to this purpose. Five out 15 of the former republics of the former USSR refer to Turkic – Azerbaijan, Kazakhstan, Kirghizstan, Turkmenistan and Uzbekistan. Most them are in Central Asia, however, certainly, the link between them and Turkey would be Azerbaijan, having a straight terrestrial connection with Turkey’s territory via Georgia. Throughout their whole history, the states of Central Asia are constantly being exposed to the influx of foreign missionaries from Turkey, Pakistan and other Arab countries, advocating Islamic religions that are non-traditional for these countries. The main impact of this external factor can be traced in the systemic influence on the educational process. Thus, for example, Turkish lyceums and universities are conducting their educational activity in the inextricable connection with the religious upbringing, as well as implanting the Turkish identity. A bright example of Turkey exerting influence via various religious movements, which at the basis of the doctrinal statement of this group are orientated at the external environment and ethno-cultural values, is the organisation ‘Süleymancılar’ (Turkish), which was established by Turkish intelligence agencies for the implementation of domestic and foreign policies in relation to the Muslims. In 2011, this organisation was headed by the former Chief of the National Intelligence Organization of Turkey, Sönmez Köksal. On the territory of the former USSR, ‘Süleymancılar’ became engaged in the arrangement of educational programs in the region of the Black Sea coast of Russia, Central Asia, the Caucasus and Volga region. These educational institutions were formed as part of the local Spiritual Directorates of the Muslims. Since its creation in 1992, the Turkish preacher Fethullah Gülen created the network of well-equipped schools across Central Asia, which was actively supported by the USA. Their main goal was to prepare employees for the state apparatus, providing their sympathies towards Turkey in the future. Fethullah Gülen hoped to transform the civilian population within the republic with the participation of well-organized and trained staff in his schools and boarding schools and create a state resting upon the basis of Shariah Islamic Law. However, well before Ankara received information on the preparation of the anti-government riot in Turkey in 2016 organised by F. Gülen, meant to seize power by a military coup, and further on listing the Turkish preacher hiding in the USA as one of the state enemies of Ankara, the schools implanted by him in the states of Central Asia became reason of worsening the relations of Turkey with the countries of the said region, and specifically, with Uzbekistan. As a result, the government of Uzbekistan, closed all the schools of F. Gülen on its territory and ceased cooperation with Turkey in the educational sphere. One cannot even think of the regional stability, considering the active aspirations of such Turkish educational establishments so inextricably connected with the religious upbringing, to implant the Turkish identity and to form a pan-Turkish world outlook among the children and teenagers. As the regional experts repeatedly noted, after such education, the learners become radicalised, and they are easily targeted by extremist and radical groups, such as ‘Muslim Brotherhood’, ‘Hizb ut-Tahrir’ and others. Moreover, the very essence of the activities of the organisation ‘Süleymancılar’ is in the fact that it should prepare the local Muslim youth, by spreading the distorted knowledge, for further utilising of the overwhelming pan-Turkism ideology in the said terrorist organisations and parties with the view of dominating in the regions. That is why in several countries of CIS, the activity of the organisation ‘Süleymancılar’ was banned by legislation. Due to the stated reasons, the government of Turkey recently decided not to interfere so directly into this region with their own specific interests, so as not to spoil the relations with Russia and China, by limiting themselves only to insignificant economic cooperation with the states of the region. Back in 1992, Ankara created the economic, cultural and technical organisation – The Turkish Cooperation and Coordination Agency (TİKA), the main purpose of which is to effectively coordinate the Turkish assistance to the states of the regions in the projects and programs in different spheres, including agriculture, education, small and medium-sized entrepreneurship, energy sector, tourism etc. Turkey has extensive business dealings with Kazakhstan and Kirghizstan, where the Turkish business sprang to feet almost immediately after the collapse of the USSR. Ankara’s influence is the strongest in Turkmenistan, which was not only the first country to adopt the Latin alphabet, following the example of Turkey, however it also established close humanitarian and economic ties with it. 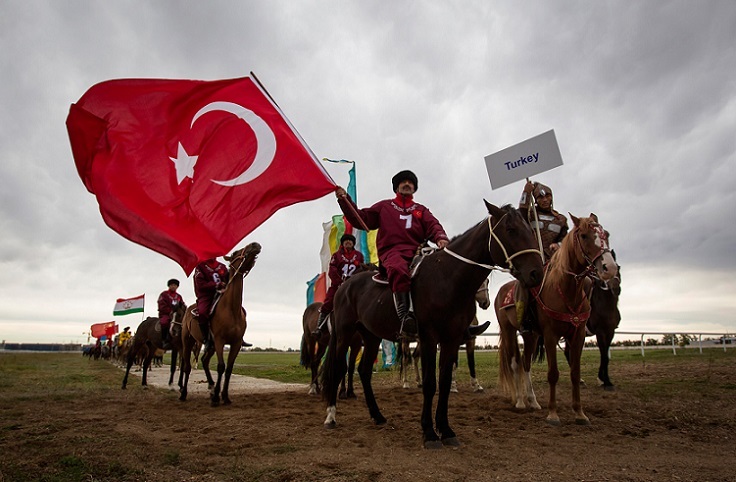 Quite often, the initiatives to strengthen the ties with Turkey come from the Turkic countries of the CIS themselves. Thus, Kirghizstan, disappointed at the first results of its speech during the EAEU at the end of 2015, noticeably activated its contacts with Ankara. That said, the Kirghiz-Turkish cultural relations started developing perhaps more actively than the economic ones. Turkey whereby is acting in the classical traditions of the soft power, using the ethnic affinity of the two peoples to strengthen its political and economic influence. At present, certain ‘developers’ in the USA, aiming to change the attitude of the states in their allegiance to Russia and China, are trying to push Ankara to a new ‘leap’ in the direction of Central Asia by hand of Turkey, however all this is not demonstrably perceived by Turkey as an expedient trend in its foreign policy. Recently in Ankara, they started evaluating the prospects of its influence in the region more rationally, especially under the conditions of remaining low confidence to Turkey in the countries of the region and due to understanding of the fact that it is still incapable of becoming a leader or a locomotive for the countries in Central Asia.